Heading into today’s Nintendo Direct, the discourse surrounding the highly anticipated broadcast had reached a fever pitch, as many speculated about the validity of various predictions that had gained prominence in recent months. Most of these predictions, in hindsight, seemed fairly rote – the sort of predictions that seem to accompany every single Nintendo Direct, often made by those presuming that this is the Direct in which Nintendo’s going to unleash the full force of their repository of classic IP. Most of these Direct predictions will sound awfully familiar: an HD remaster of the Metroid Prime Trilogy (nowhere to be seen today). The reveal of a new DLC character for Super Smash Bros. Ultimate (also absent from today’s broadcast). The first showcase of gameplay for the newest Animal Crossing, which Nintendo insists is coming this year (nope). Perhaps even a reveal of Game Freak’s first core Pokémon game developed for consoles (sorry, friends). However, despite the absence of these heavy hitters, Nintendo still managed to produce a Direct that many of its fans found satisfying, and achieved this goal in the most Nintendo way possible: by zagging where you would have expected them to zig. Nintendo began their Direct with a game that produced excitement while also subverting expectations in equal measure: Super Mario Maker 2 – and while we didn’t see much of the game, we saw enough to know that it is, in fact, a genuine sequel to the debut title released on the Wii U. This reveal kicked off the first Direct of 2019 with a clear, concise message: the age of Wii U ports on the Switch is coming to a slow yet indeed definitive conclusion. Had this game been revealed two years ago, it would have most assuredly been titled Super Mario Maker for Nintendo Switch, or something along those lines. Instead, fans now get to look forward to a completely new creative suite – one that they’ll be able to take on the go, crafting levels whilst making their daily commutes or visiting friends. And the game’s coming sooner rather than later – the announcement trailer revealed a launch date of June 2019, meaning that Super Mario Maker 2 will likely assume a prominent position in Nintendo’s next Direct or E3 Showcase. It was from there that the Direct, hosted by Nintendo’s Yoshiyaki Koizumi, segued into showing off a number of games coming to the Switch this year. Marvel Ultimate Alliance 3, revealed at the Game Awards in December, made a brief appearance, showing off its vast roster of playable Marvel heroes. Super Smash Bros.’ Spring update was teased, but no concrete details were given – although Nintendo did confirm that Persona 5’s Joker would be added to the game’s roster before the end of April. Less prominent titles in the Nintendo stable such as Captain Toad and Boxboy also got their moments to shine, although the announcement of new paid DLC for Captain Toad, a port of a five-year-old game, was puzzling. The Captain Toad DLC might be the sole moment in the entire Direct that existed in opposition to what I felt was a consistent theme throughout the broadcast: Nintendo’s unapologetic shift into a new era when it comes to supporting the Switch. It should be noted that this was the first Nintendo Direct in recent memory in which the 3DS wasn’t even mentioned; rather, Nintendo chose to focus the entirety of this 2019 preview on its marquee console. The majority of games that were revealed today were games that would never have been able to function on the handheld platform, signaling a shift in Nintendo’s approach to game development. Perhaps Nintendo was trying to send the message that it’s ready to embrace the Switch’s potential as the console/handheld hybrid system we’ve assumed it was since launch. Either way, it was a welcome move, even if it represented a sad reality for the 3DS family’s 72 million adopters. It can be argued that Nintendo spent the first two years of the Switch’s life cycle atoning for the failures of the Wii U – many games that failed to flourish on their previous console, such as Pokkén Tournament and Hyrule Warriors, found new life on the Switch. It’s been a fair criticism of Nintendo that, especially in 2018, the majority of the Switch’s notable AAA titles were ports or games that could be easily mistaken for them. Today’s Direct signaled a shift in direction: now that the Switch has built up a solid and loyal following, Nintendo’s finally ready to begin showing off high-profile titles that were designed from the ground up for this system. That isn’t to say that Nintendo didn’t occasionally capitalize on nostalgia in today’s Direct. Square Enix’s presence in the Direct was largely port-based, announcing impending releases for ports of Final Fantasy VII and Final Fantasy IX. Their other marquee showcase was a port of 2017’s Dragon Quest XI, which played directly to the nostalgia of its fanbase with the reveal of an optional 8-bit mode through which one can play the entirety of the game. However, these moves were few and far between, and with the exception of perhaps one massive reveal, were rarely made by Nintendo’s own studios. Another sign of the shifting winds of change over at Nintendo was the surprisingly strong third-party presence: today saw announcements of Switch versions of Mortal Kombat 11 and Unravel Two, the former of which is especially notable given that it’ll be one of the few instances of an unreleased third-party Switch game releasing alongside its Xbox and Playstation counterparts. Toby Fox’s Deltarune demo, released last year for PC, was also confirmed for Switch with a new, predictably charming trailer. (While it’s a long-shot, this raises the question as to whether Fox is close to assembling the all-star team he said he would need in order to bring the game’s final version to fruition.) Ubisoft’s previously announced remaster of Assassin’s Creed III was also confirmed to be coming to Switch. Most of these announcements (and more) were relegated to quick “headlines”. The Direct’s marquee showcases belonged to the aforementioned Dragon Quest XI and Fire Emblem: Three Houses. Three Houses, Nintendo’s first Fire Emblem game for consoles in twelve years, had a predictably strong showing. Perhaps the game’s most intriguing departure from its predecessors comes in the form of its setting, which takes the political intrigue that Fire Emblem is known for and places it in an academic context. Due to the nature of the titular three houses that the player can choose to join, comparisons are already being made to Harry Potter – except you’ll be playing from the teacher’s perspective, which lends a whole new dimension to Fire Emblem’s usual relationship mechanics. But Nintendo being Nintendo, they couldn’t end their Direct without showing viewers something that they hadn’t seen before – except this time, they showed us two things we hadn’t seen before. The first was Astral Chain, a cyberpunk action game from PlatinumGames being directed by Takahisa Taura, director of NieR: Automata. The game’s development is also being supervised by Hideki Kamiya, which meant that Nintendo couldn’t let the segment go by without a reference to Kamiya’s other claim to Nintendo fame: Bayonetta. Koizumi reassured fans that development on Bayonetta 3 was going well, and that we’d hear more soon – one of the few references to a marquee title that fans wondered if Nintendo would show at this Direct. But of course, there had to be a “one more thing” – and there was, but it wasn’t Animal Crossing or a Smash reveal – rather, it was a game that Nintendo fans didn’t even know existed prior to this Direct: a full-on remake of 1993’s The Legend of Zelda: Link’s Awakening for the Nintendo Switch. This was another case of Nintendo zagging where you would have expected them to zig – many assumed that if we saw a Zelda remake during this Direct, it would have been a remake of Skyward Sword. Instead, we got Link’s Awakening, replete with a charming new art style and a tease of the Ballad of the Wind Fish. 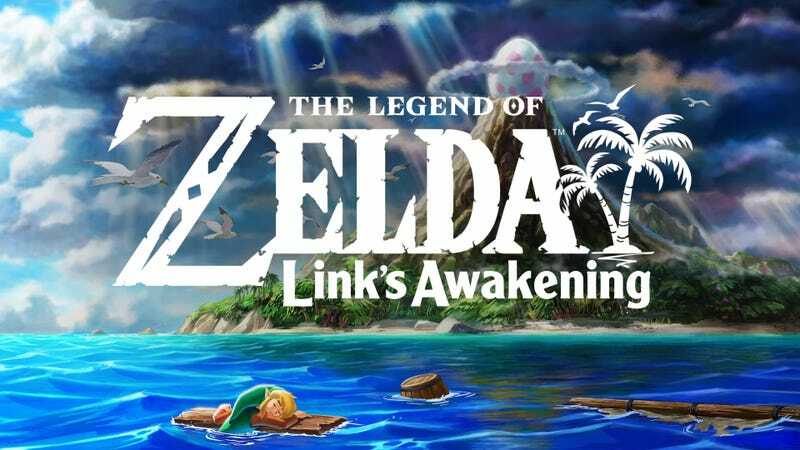 Perhaps the reveal of Link’s Awakening is the greatest indicator of how Nintendo’s approach to game development is shifting in 2019 – rather than a port of a Wii game from 2011, Nintendo is delivering a remake of Link’s Awakening built from the ground-up for Switch. It’s an exciting departure for the company, and raises all sorts of interesting possibilities for Nintendo’s future: will they remake more of Zelda’s iconic handheld titles? Could we see a Super Nintendo game like A Link to the Past get a similar treatment? Are remakes of the Oracle games coming down the line? It’s also important to note that the reveal of Link’s Awakening also answers another important question that arose with the arrival of the Switch in that the Switch has officially become the new home of top-down “2D” Zelda titles along the lines of A Link Between Worlds. This remake of Link’s Awakening signals that there’s still a home for this style of Zelda on Nintendo hardware – but the 3DS is no longer that home, signaling another death knell for Nintendo’s aging handheld ecosystem. This wasn’t the Nintendo Direct that many fans wanted or expected – but it was one that gave people plenty to be excited about. It’s not hard to imagine a world where, a few months from now, many of the titles absent from today’s Direct take center stage at E3 – Animal Crossing, Pokémon, and Luigi’s Mansion are all slated for this year, and we haven’t seen a glimpse of any of them yet. If today’s Direct is any indication, however, the odds exist that we might not have the faintest concept of the full breadth of Nintendo’s plans for this year – and that might be the most exciting takeaway of the entire event.